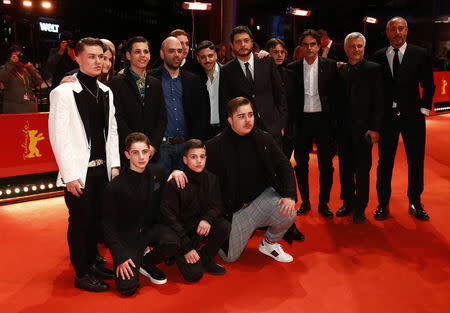 BERLIN (Reuters) - "Piranhas", a film about children wrapped up in the violence of the Neapolitan drugs trade, was inspired by crime journalist Roberto Saviano's desire to understand the emotional lives of teenagers who knew they were heading for violent early deaths. The film, based on his novel of the same name, is one of 16 in the running for the Berlin Film Festival's Golden Bear award, and shows the naive beginnings and breakneck escalation of the criminal career of a young boy named Nicola. "For the first time in international criminal history young kids have got to the highest levels of a criminal group," said Saviano, author of the best-selling account of organized crime "Gomorrah", ahead of the film's premiere on Tuesday evening. "There have always been children in these organizations but never as bosses. This is a unique case in history and that is what got me to work on it," added the author, who lives under 24-hour guard because of his organized crime reporting. Set in Rione Sanita, a deprived area near the center of Naples, the film startles the viewer with each sudden escalation in Nicola's level of criminality. Nicola (Francesco Di Napoli), first sells weed for the local gang so he can ask them to stop demanding protection money from his mother's laundry shop. Before long, he is torching cars and murdering rivals, even while pursuing a quintessentially teenage romance with neighborhood waitress Letizia (Viviana Aprea). "What does a 12-year-old or a 15-year-old feel when they make millions of euros, above all when they know they are heading for their death," asked Saviano. "People are dying at 19 or 20, thinking they have lived a full life." "If you come from an extremely poor family and have nothing at all, you have a hunger within you," said Artem Tkachuk, who plays another gang member. "The alternative is to have a dream, to be able to fight for something they love." Saviano was critical of Italy's political class for having "given up" trying to offer something for children, leaving them to take their fate into their own hands.